"I love being right where I am now, in Montana. We had the most perfect white Christmas this year. Eight inches of beautiful, fat, soft snowflakes. It was picture postcard perfect. I wouldn't want to be anywhere else..."
1) Answer the following question on this post only between January 1st and January 14th. "If you could be anywhere in winter, where would you be?" Only entries beginning tomorrow, Jan. 1st thru Jan. 14th will be counted. 2) You do not have to have a blog to participate - just make sure you leave me an email address for contact if you are the lucky winner. I will ship anywhere in the world as long as I can contact you. 3) On January 15th, Mr. 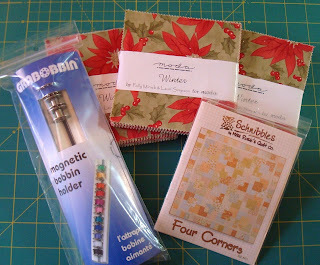 Squash will draw a lucky winner for the following goodies - Schnibbles by Miss Rosie's Quilt Co. "Four Corners" pattern and three charm packs of Moda "Winter" by Polly Minick & Laurie Simpson. The pattern calls for 83 charm squares, so you will have more than enough! Also included is my favorite new gadget, the Grabobbin magnetic bobbin holder which includes 3 bobbins! Many thanks to Debi for hosting this giveaway! And be sure to check out the Whirl Into Winter blog for a complete list of those hosting giveaways - lots of luck to everyone! This morning after I got my hair cut, Mr. Squash and I went to Seattle to Rejuvention to pick lights for the kitchen at the Squash House. What a wonderful store! They had just enough to select from so that you weren't overwhelmed by choices! Plus I had spent a lot of time perusing their catalog and checking out the website before we made the trip. I pretty much had in mind what I wanted when we walked in the door, and sure enough, with a couple of minor changes, it didn't take long to place the order! Two of the light on the left will be on the kitchen ceiling, and the the smaller pendant will hang over the kitchen sink. It was really hard to get the finish (brushed nickel) to come out on the website, so I substitued polished chrome, which comes out closer when viewing it on the web. But as you can see, neither look the same, so you just have to use your imagination! The house was built around 1948-50, so this is a small concession to 50's style. Mr. Squash wants to put a chrome table and chair set in there as well, but I'm standing firm against it! I grew up with one and never liked it then! Yesterday I finished another Winter Wonderland block - this is called Cut the Corners. My flying geese ruler wasn't the correct size for this block, unfortunately. I cut out two more and hope to finish them this afternoon, but it's growing later and it may not happen until tomorrow. I do feel like I'm getting closer and closer to the half-way mark! Yesterday between making split pea soup and various chores around the house, I put together three more blocks for my Winter Wonderland quilt. This one below is a 9" Friendhip Star block. It's the last one of these in the quilt. The two below are 6" blocks - I'm not in the studio, otherwise I would tell you what they are called. It's a real challenge for me to work with such small blocks! My hands are by no means "delicate" thanks to my Lithuanian heritage, and they don't work as well as they used to. But I think overall, the blocks turned out well. I have to make three more of these in 9" blocks - I think I'll use my new flying geese ruler and see if that makes it easier. I find it odd that when I photograph some of the blocks they look as though the seams don't quite meet on the edges - but I assure you they do! Mr. Squash and I are off this entire week - woo-hoo!! 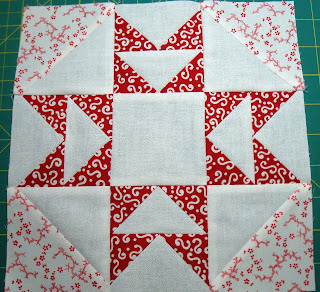 I plan to really put a dent in the making of the rest of the blocks for this quilt! Tomorrow we're heading into Seattle to a store called Rejuvenation to pick out the lights for the kitchen at the Squash House. 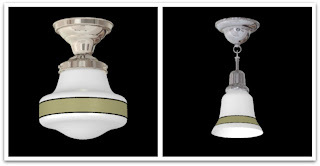 I got a catalog from them some time ago and found they not only have a great selection of lighting, but you can have any combination of shade, pendant, finish, etc! And their prices are quite reasonable as well! They also carry knobs, register covers and many other items for the home. This morning brought more melted snow and welcome rain! We still see 10 foot piles of snow all over town, and a lot of it hasn't melted from sidewalks, roofs and streets, but there has definitely been progress! Today we were supposed to transition into warmer weather and rain. The following will not look like that to you! This morning the temps were up above freezing, so I decided to take our reliable Jeep Wrangler to the mall and see what after Christmas sales are all about! I've only been one other time - many years ago, and thought since a lot of folks weren't getting out because of the snow, that maybe it wouldn't be too crowded. I was right, however because so many freight deliveries have been delayed by our huge amount of snowfall, the sales to be had were miniscule! REI said they hadn't gotten any of their Fed Ex deliveries, and their shelves definitely reflected that! But I did manage to find some good snow boots at 40% off at another store and scored a couple of other good deals! When I got home, this began to fall! This is looking out our front porch. Here is my car -- it hasn't left that spot for over a week. If you could see the other side, you would see a huge pile of snow from the plows that have gone down the street. And this great shot is from our upstairs landing looking across the street! I also stopped at our local quilt shop. They were having a 25% off everything in the store sale. Believe it or not, I came home empty-handed! There wasn't much inventory, let alone anything I couldn't live without. Perhaps they've had trouble with deliveries, too! This weekend I plan to visit Keepsake Cottage in Country Village, where I'm most certain I will leave some cash behind! 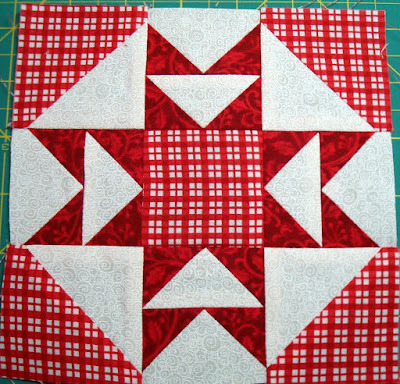 Here is the other block I finished that I forgot to photograph. Looking at it here I see one little intersection that doesn’t quite match up, so I’ll correct that before the quilt is assembled. 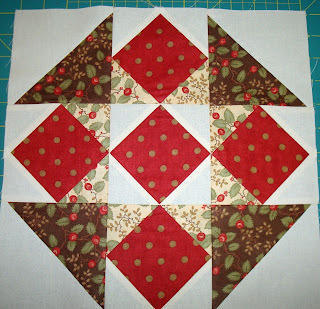 Now that I’m caught up with these Designer Mystery BOM’s, I’ll go back to working on Winter Wonderland blocks. I may also put together the center stitcheries and fly stitch between them. I thought I would treat you to this great Christmas ham recipe I’ve been making for many years. The first year I made it I was single and had the folks at my office over for a holiday dinner. I couldn’t get them out of the kitchen after dinner – they literally hovered over the leftover ham and picked the bone clean! It can be made with just about any ham as long as there is a little fat on the outside to make some pan drippings. This year I’m using a bone-in, spiral-cut ham. Enjoy! Cut off and discard the tough, leather-like skin from ham. Score fat and stud with cloves. Place in roasting pan and pour champagne over ham. Bake, uncovered, in a 325° oven, basting frequently with pan drippings, until a meat thermometer inserted in thickest portion (not touching bone) registers 140°, allow 20-22 mins per pound. Meanwhile combine mustard, sugar and brandy in small pan. Place over low heat and cook, stirring, until sugar dissolves. Brush ham with mixture several times during the last 30 mins. of baking. Serve remaining mustard mixture with ham as desired. In yesterday’s post you saw how hard Mr. Squash and our neighbor worked to dig us out from the previous night’s blizzard. Well, this morning, you would barely know they did anything! 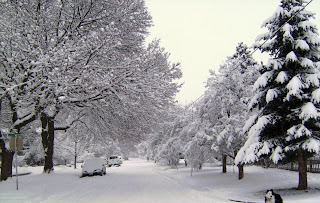 We got another 6-8” in our area last night and more is predicted! This morning’s weather predictor said the record for snowfall was 57 inches in the month and year I was born - we aren’t even close to that, but it sure feels like it! I dropped Mr. Squash off at work this morning, then came to my office. Only two of us in the entire building have shown up this morning - probably because we both have 4WD vehicles! Here we are parked catywampus outside the front door. When I was taking this picture, my feet were so deep in the snow I couldn’t even see them! I’ll try not to post too many more snow pictures this week, but I can’t help myself - it is kind of fun if you don’t have to venture too far from home! I finished two more blocks yesterday, but forgot to take a picture of the second one. I hope to get off early today, and the rest of the day will be spent filling up the bird and squirrel feeders, and perhaps making a batch of cookies or two. I was inspired by this comment from Ranny over at Quilting Ranny on yesterday’s post: "Church was canceled, so we made 8 loaves of pumpkin bread, 100 sugar cookies & frosted them, no bake cookies and peanut butter fingers. Tomorrow I will make fudge and we will pass out goodies to our neighbors! " I may not be quite as ambitious as Ranny, but baking cookies sounds like fun in this weather, and Mr. Squash won't mind one bit! We've been joking around here for a while about the Bizzard of '08, but it's no longer a joke! We got quite a blast last night! The wind howled and the snow came in horizontally most of the night! Temps are still in the 20's and more snow is expected! I have an old shoebox of photos from my childhood. I rummaged through there this morning looking for a particular photo, which I didn't find, but came across another that I knew I could have some fun with! When I saw it, I realized we have a similar tree in front of our house. So I had Mr. Squash take a photo of me while he was shoveling snow and here's what I came up with! Funny how things stay the same - the old photo of me was taken in Seattle's Phinney Ridge area in the mid-50's. Today's photo is about 35 miles north of that. 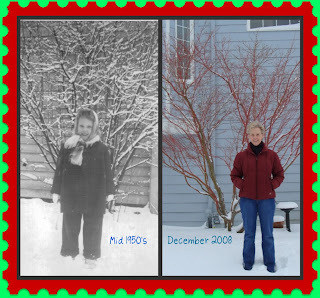 Still the same me - bundled in multiple layers of clothing! This is a photo looking out the window of my studio - which is on our third floor! The snow piled up is between the screen and the window! That's how hard the wind was blowing! Here is Mr. Squash and our neighbor working on the porches and sidewalks. Our neighbor, Geoffrey, and his rescue dog, Maddie, a Dutch Shephard. Maddie was having great fun bounding around through the drifts! Thanks, Geoffrey for all your help digging us out! In-between stocking up our larder and various errands yesterday in preparation for the big blizzard, I mananged to get another Mystery BOM done. I'm off work beginning Christmas Eve through New Year's Day, so there will be a lot more quilting to come! Hello friends, Frosty here. Candace is busy this afternoon making chili and wrapping presents, so she asked me to guest blog for her! I think I may be around for a while - it's been snowing on and off since last night and the temps are predicted into the teens through next week and more snow! I really enjoy these long stays. Most years I'm gone in the blink of an eye! 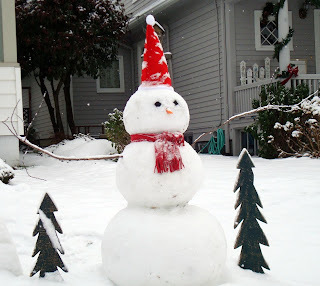 There are several imitations of me up and down the street, but I'm here to tell you I am the real Frosty! Anybody up for chili? What a great day for it! Here's an easy recipe Candace has been making for over 20 years. It goes together quickly and tastes oh, so good! Heat oil in large, heavy kettle and add meat. Cook, chopping down and stirring to break up lumps until browned. Add onions, pepper, celery, garlic, oregano, bay leaves, cumin and chili powder. Stir to blend well. Add tomatoes, broth, water, salt and pepper. Add red pepper flakes if desired. Bring to a boil and cook, stirring often, about 20 minutes. Add beans and cook 10 minutes longer. Serve in hot bowls with a dollop of sour cream and lime wedges if desired. Goes great with freshly made cornbread or grilled cheese sandwiches! 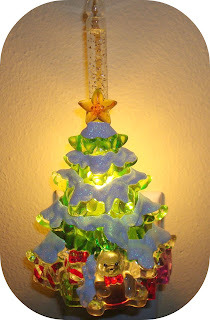 Now the funny thing is --- I have yet to make this!! Every year I look at it in my pattern stash and tell myself this will be the year! Well, 2008 is quickly drawing to a close, so perhaps it will get made for winter of 2009! Our contractor sent me these picture of the Squash House this morning. He took them a couple of days ago. Mr. Squash remarked after he saw them, “Remind me why we’re moving there again?”!! Actually this is unusual for that area of Eastern Washington. They don’t normally get much more snow than we do here in the Pacific Northwest! According to my friend, Carol, who lives there, it was 8 degrees below zero last night! Yikes - I’d best get that jacket made! I'm always struck by how small the Squash House looks from the front! We actually have about 2400 sq. ft! We also think the "real" front of the house is in the backyard. Next time we're over there I'll try to get some pictures from that angle. Here is Ted's dog posing in the snow! Yesterday between trips out in the snow and cups of hot chocolate with marshmallows, I thought I would catch up on my Designer Mystery BOM from the Fat Quarter Shop. Since I had three blocks to catch up on, I thought the easiest way to do it would be to cut them all first then sew. For some reason my favorite iron (admittedly I have way more than 1) decided to spit out a glob of oil on one of the fabrics in block 4 - the first one I cut! Not only did it spit out a glob of oil, but I didn’t realize it had happened until I had smeared it over most of the piece as well as a part of the ironing board cover! I managed to cut a few pieces around the smear, but not enough to finish the block. So I thought I would be really frugal in cutting that fabric for the next two to see if I could make it up. 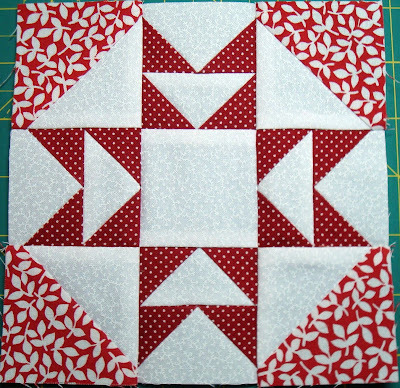 I had already checked the leftover fabric from the first 3 blocks and there wasn’t enough to cut anything! Alas, I just couldn’t make enough leftovers to finish cutting block 4. So I emailed Kimberly at the Fat Quarter Shop. She got back to me this morning and said they save a bit of fabric just for these instances and would be sending me a replacement at no charge! Now those are the little things that really amount to great big things in my book! Thanks, Kimberly and crew! Here is one of the blocks I finished yesterday - my favorite so far! A little thing Mr. Squash and I do is to take care of the birds in our yard in winter (and summer). They give us so much joy in watching them in return! Yesterday, since the temps are below freezing and we have so much snow on the ground, I took hot water out to the bird bath and un-froze it, put out a new nut/seed block for them and filled up the Nyger feeder. Our goldfinches didn’t leave this winter - I think they like our hotel better than wherever it is they usually go! And let’s not leave out our furry friends, the squirrels. We have a pair we call Bruno and Twiggy for their sizes. It’s so much fun watching them chow down on an ear of corn and then shinny up the bird feeders for more! Finally, would you do a “little” thing for me and go over and wish Karen at Short Story Long a happy birthday? She is a terrific, creative, quilter, knitter, artist, photographer and mom (I’m sure I left something out)! Happy Birthday, Karen! We woke up to several inches of snow this morning! It was predicted to be spotty, but I think they were wrong! 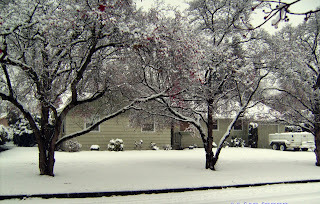 Seems the entire Puget Sound region woke up to a lot of white stuff! Being that we are merely blocks from the Sound, this is quite unusual for us! It's supposed to get even colder throughout the day and more snow is predicted for the week ahead! These are photos I snapped not long after we got up. You see Mr. Squash, aka, Mr. Snow, shoveling the front walkways. He's wearing his Australian "Crows" hat for any of you down under who know what that is! 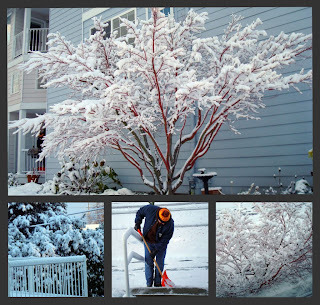 He kindly shovels our neighbors walkways as well - most always some yummy treat comes his way as a result of this kindness! And I usually benefit greatly from the snow as well - I work for teachers, and if there is a snow day - that means a "quilting" day for me! Yippeeee! Here is my photo! 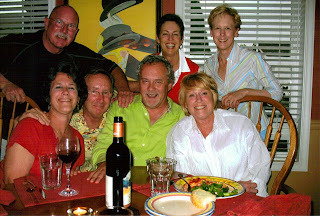 This is a group of my closest friends from college days - dare I say - 40 years ago! We try to get together once a year. Some years we meet at Christmas and some during the summer. This time was in July of this year. Not all of us make it every year (Carol we missed you! ), but we do stay in touch. We look pretty good for old folks, huh! We're spread out around the country and all have diverse backgrounds. Gathered here you see video store owners, a culinary specialist, a real estate agent, a newspaper editor, a catering manager, and myself - and of course, you all know me - LOL! I think it's wonderful that we've kept alive this tradition of getting together. This was fun! It was nice to see this photo again - I always enjoy getting together with these friends and hope we can do it for a long time to come! It's snowing out and there's pot roast in the oven...oh, what a wonderful day! Mr. Squash just called to tell me how proud he is of himself! He was doing some online shopping and has heard if you Google “promotional code” and the store you’re shopping in, you can find all sorts of good deals like 25% off, free shipping, etc. Turns out my Christmas gifts may even benefit from this! Way to go, Mr. Squash! I also want to remind you all of a couple of giveaways! 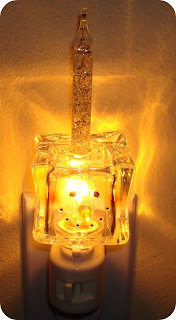 Nanette over at Freda’s Hive is on Day 6 of her 7 days of give-aways. She has a lot of great gifts, so please go over and leave a comment! 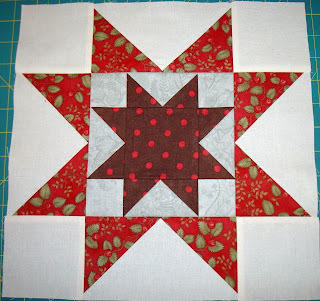 Also Eileen over at My Quilting Porch is giving away a pattern for a terrific holiday tree quilt that she and Kim made! Eileen really wants a lot of people to enter, so please check it out and leave her a comment! When I turned over my perpetual quilting calendar to today’s date, I found this block. It looks great next to some of my vintage Shawnee pieces that I keep at my desk! 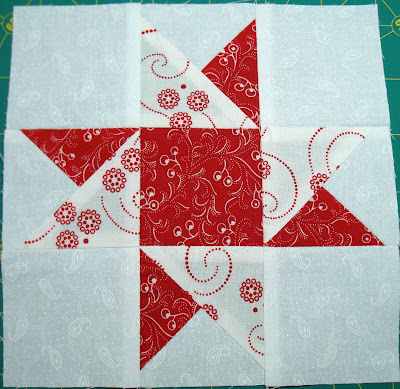 I think a quilt using this block in Christmas fabrics would be terrific! And since the block is called Honey’s Choice, perhaps I should have Mr. Squash choose the fabrics for it! We’re expecting snow here in the Pacific Northwest, so for all of you still sweating in hot climates, I may have a “cool” post for you tomorrow or Sunday! This morning as I was preparing to dump my purse, satchel, lunch and running shoes on the passenger seat of my car, I noticed something on the floor that I was positive wasn’t there last night when my husband and I came home from having dinner out. It was the small manual for the car that I kept in the glove box. Before I did anything else, I walked around the car, checked the locks, and made sure the car didn’t have any outward damage. I then opened the glove box and found it nearly empty - the large zippered pouch that held the complete manual and my car registration was gone along with some maps. I opened the center console box and found that two pairs of prescription glasses were missing and also a pair of cheap leather gloves that I had worn the day before and had left on the console. Other than that, the book on CD was still there, the stereo was intact and even the change in the console was still there. All I could think of was that I didn’t press the button on the key hard enough to make the door lock last night. So I called Mr. Squash at work and told him the sad story and he suggested that I at least report it to the police. It had to have been adolescents and we get a lot of car prowls in our neighborhood. They might as well know about another. After hanging up I had the thought to check one other thing….the valet key that I keep in a small pull-out drawer on the dash. It was gone! 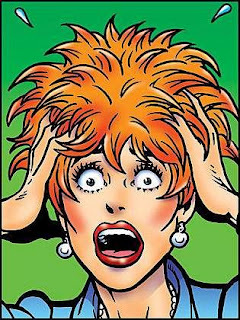 I called the dealer who told me it would be a couple of days to get the parts to re-key the car and it would be safest to just leave it with them until the work was done. The kids that took the valet key might just be bright enough to eventually figure out they can drive the car away at will! After meeting at the dealer and dropping off the car, we drove back toward work in our other car. 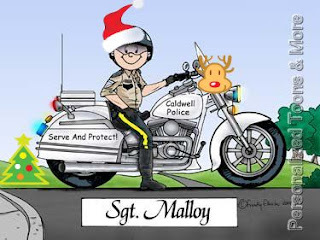 We drearily discussed the cost of this little folly, when what do we see in our rear-view mirror but dashing red lights, and it was not Santa and his sleigh! Mr. Squash got ticketed $120 for going 10 miles over the speed limit! Now this is not something he ever does….you might even have the occasional notion that he drives too slow! The motorcycle officer handed over the ticket and asked if we had any questions. Well, Mr. Squash and I both ride BMW motorcycles (we aren’t currently) so he asked about the officer’s BMW! Mr. Squash then said to the officer: “Please forgive me for my wool gathering, but my wife’s car was prowled last night and we were just returning from the car dealer arranging for repairs”! You should have seen that officer’s face! It dropped like a Slinky! I think if he’d known that before he handed out the ticket, he might have had second thoughts! Tomorrow WILL be a better day. I think this calls for some serious quilting time! Before I forget, have you been to Freda's Hive today? Remember, Nanette is having 7 days of give-aways for her 100th "blogiversary"! I love holiday bubblers! Over the years I've collected them for several holidays....Halloween, Thanksgiving, Christmas, and others. We actually don't have enough "visible" outlets for all of the Christmas bubblers, so here are a few of my favorites. This is new this year, from Dept. 56. Can you tell this is an ice cube? 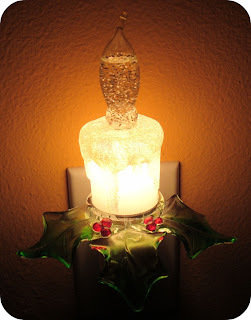 This was the first one, my husband's favorite....he says it reminds him of Christmas tree lights from his childhood (mine, too). 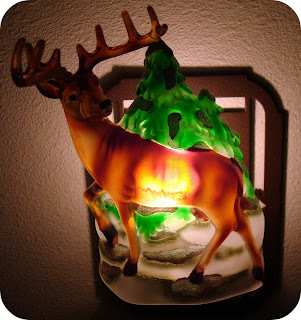 I keep this one up all year in my "fishing bathroom". This was new last year - I added the snow using Picnik. ***UPDATE: I forgot to mention to please visit Nanette over at Freda's Hive! She is having a terrific give-away for her one year blog anniversary! This weekend Mr. Squash and I ventured out to find some holiday cheer. Saturday we went to a town near us that is filled with antique stores. We thought we would hit all of the antique furniture stores to see if we could find a Kitchen Queen for the Squash House kitchen. We didn’t find one, nor did we find much in the way of holiday cheer. There was a notable lack of holiday decorations on the street and in the shops. We appeased ourselves with freshly baked Snickerdoodles from the local bakery and went home otherwise empty-handed. Sunday we had brunch in the Pike Place Market in Seattle with a very good friend. After brunch, Mr. Squash and I decided to walk into the market, again looking for holiday cheer. My family’s U.S. history began in the Public Market as we locals call it. Some of my maternal ancestors had stalls in the market, most notably my grandmother who was a tailor and in later years, one of my fraternal cousins was actually director of the Market Authority. I’ve been going there since I was a little girl. While there have been many changes, I never tire of buying from all the various local vendors and now crafters. We headed for our favorite shop in the Market - an Italian grocery. Mr. 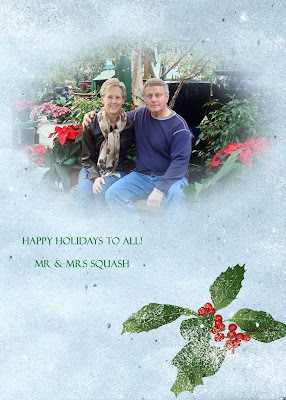 Squash always springs for something unexpected and sometimes extravagant during the holidays. Here is his purchase - imported from Italy, very expensive and oh - so- scrumptious!! Hmmm...do you see a theme here - holiday cheer in the form of food - you betcha! By the way, we found even less holiday cheer and decorations at the Market. It’s a shame that our economic times can have such a negative effect even on Christmas! I also got out one of my holiday quilts. I made this one several years ago - one of my first bed-sized quilts. The only quilting I did was to stitch in all the ditches because at that point I was still too intimidated to try anything more. I’ve come a long way since then, and can’t imagine doing a quilt this large now without some really great quilting! I haven’t had it out for a couple of years and knew it needed to be washed, so that is why it’s so wrinkled. I backed it with flannel and used Warm & Natural for the batting. I thought about taking it back to the studio and adding some quilting, but after washing it, I decided I might wind up with too many puckers and ruin it. No matter - I really love it the way it is! Here is a close-up of the backing...you can tell it has seen some good use! Quilting has taken a back seat pretty much this week, I’m sorry to say. But what’s in the front seat right now is pretty exciting for me! 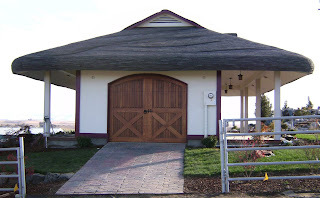 I spent most of yesterday talking with the builder who is helping us update the Squash House and various vendors trying to understand construction concepts and make decisions on some of the materials to be used. Mind you, we aren’t “remodeling”, just “updating” a few things over there. The kitchen is the main update and is totally my baby! I’ve been saving for many months to turn it into the kitchen of my dreams! Actually not much needs to be done, but hey, I’ve worked long and hard all my life and I would like to enjoy my retirement with a kitchen where I can be proud to create great fooding (and Mr. Squash knows he will benefit greatly from this). I made this little collage using my favorite new program Picnik. I like it so much I’m thinking of upgrading to Premium status. The counters are going to be maple butcher block which will look much like the one in this picture from the supplier. I still want to do the one smaller counter in marble which I talked about here, but the more I look at this picture, the more I lean toward all butcher block…..stay tuned on this one. The glass tiles will be the counter backsplash as well as the wall behind my stove, and the actual pass-thru countertop between kitchen and dining room. I love the kitchen sink faucet - it has a 68” pull-out hose on the faucet end - so rather than fill a large pot of water at the sink and lug it to the stove, you just pull the faucet end over to the stove! 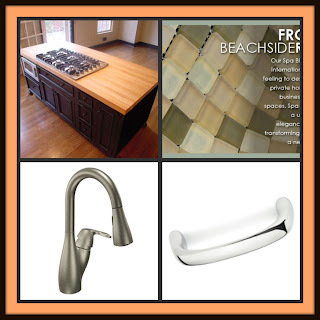 And I will probably look for a different cabinet handle as after I made the collage, I realized there is too much contrast between the faucet and handle….ugh, another decision to make! Tomorrow I’m putting Lisa's Mexican Beef Stew in the Crockpot and retreating to the studio for a little quilting! Have you noticed more and more things come with instructions these days? “No Loitering”, “Do Not Touch”, “Keep Children and Small Pets Away” are a few we see frequently. On our adventure at Flower World we came across this lovely water feature in one of the greenhouses complete with Koi and turtles. Of course it came with instructions! We went here the same day. You might think that we really get around - buying plants and fly fishing the same day you say? Nope - just another water feature at the nursery! Niki over at Pumpkin Country is having a Last Push Quilt-a-thon. She invited me to join, but I really don’t have any last minute gifts to get ready! So I offered to help spread the word for her! If you have last minute gifts you need to get made or finished, this might be incentive for you! Check it out! 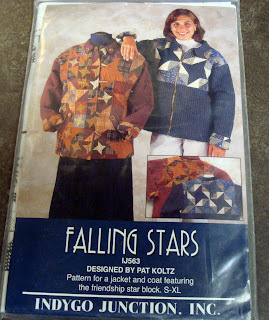 Lately I have been having dreams about quilt bloggers! You would think my dreams would be filled with actual quilting “segments” or ideas for new quilts. But no….I’m dreaming about you, dear quilt bloggers! My husband commented the other night that we are sometimes so clever in our dreams - much more so than in real life at times! I know I’ve had elaborate, intricate dreams that are terribly clever, but do I remember them for more than a few seconds after I wake up? Of course not! So back to my recent dreaming adventures. Last night my dream was about Des over at Quilt Taffy! In the dream I had to have a caterer make 400 ham sandwiches for a meeting. The next thing I know I’m at Des’ house where she is in her garage playing Mama Mia at full volume! I asked her where the sandwiches were and she said I hadn’t given her enough time to make them. My dream-self was panicked, so I offered to help her make them, we struck up a deal, and off we went to slap mayo on the bread and pile on the trimmings with Mama Mia still playing full blast in the garage! So Des, how are you at making sandwiches? 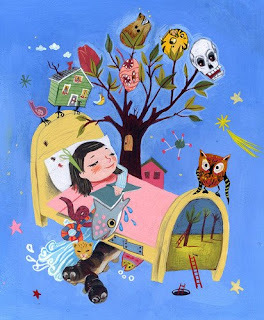 The other dream that stands out vividly is with Pam over at PamKittyMorning and Elizabeth at The Late Bloomer! I was making the rounds of garage sales when I found myself in front of Elizabeth’s garage. Turns out she had won the lotto (are you reading this Elizabeth?) and invited everyone in to her garage to see all the clothes she had purchased that were now in her garage - which was now her closet! And she was such a generous friend that she had purchased clothes for her friend, Pam, and made a space for her in the back! Maybe this is a sign for both Elizabeth and Pam to buy lotto tickets this week! So I’ll leave you today with a few more pictures from our trip to Flower World. Enjoy!